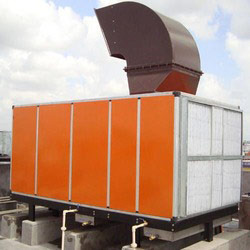 We are one of the leading manufacturer and exporters of high quality Air Scrubber. Manufactured to extract all types of dust particles, acidic fumes from air that is generated during different types of industrial operations. This scrubbing helps in creation of a fresh environment for working within the organization. These dust particles are generally generated during chrome plating, nickel plating, galvanizing and pickling. Looking for Air Scrubber ?